This was the 18th year of Camp Walleye, and it was another great one. We paid homage to our great country we live in; work rewards its citizens with the ability to pursue the passion of fishing. 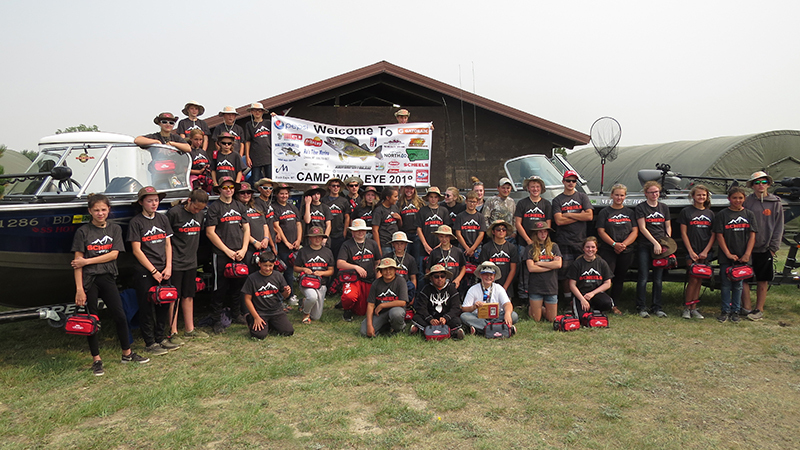 This year’s camp had 50 kids, 35 boats, and 75 boat captains/co-captains and volunteers who came together to share their passion of fishing with the campers. As in the past, the camp was held at Tiber Reservoir (which is the perfect place because there’s no internet or cell phone service to distract the campers). Because of the weather, our numbers of fish caught were substantially affected, with just a few over 300 fish caught; whereas, on a normal year we would have been around 600 or so; however, a positive for camp was every kid caught at least one fish, and over six walleye were caught that measured over 26 inches. The largest was a 33-inch and weighed in a bit over 12 pounds. Landon Navarro caught this walleye, and Kaleb Axtman caught a 10-plus-pound, 30-incher. Following those two measurements was Jonathon Neujahr who brought in a 26-incher, 28-incher, and seven other walleye on the same afternoon. He was on a roll! We always love mentioning we had new boat captains, and three of them included former campers who were able to volunteer this year. The mission and vision of this camp is just that: to form a full circle by having campers return as boat captains and share their passion of fishing with the next generation. Camp Walleye relies on volunteers and donations. We could not do this without all of them and always appreciate everyone who is involved.